Heat oven to 425°F. Spray 9-inch round cake pan with cooking spray. In 2-quart saucepan, heat rhubarb, 1 cup sugar and 1 tablespoon water to boiling over medium-high heat. In small bowl, mix cornstarch and 2 tablespoons cold water; stir into rhubarb mixture. Reduce heat to low; simmer uncovered about 5 minutes, stirring occasionally, until rhubarb is tender. Cool sauce about 30 minutes. Stir in strawberries. In medium bowl, stir Bisquick™ mix, 3 tablespoons sugar, 1/2 cup milk and the butter until soft dough forms. Press in bottom of pan; brush with milk. Sprinkle with 1 teaspoon sugar and the almonds. Bake 15 to 20 minutes or until light golden brown. Remove from pan; cut into wedges. Split wedges horizontally. 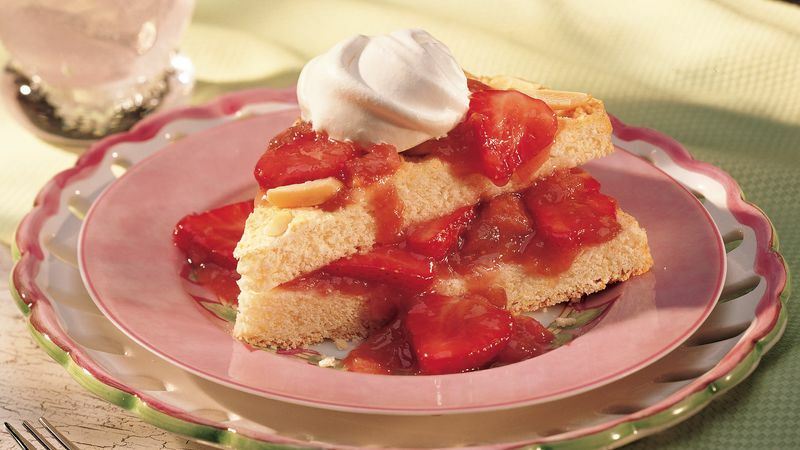 Fill and top shortcakes with sauce; top with whipped cream. Quick Tip: If you prefer to make individual shortcakes, decrease the amount of baking mix to 2 1/3 cups and drop the dough into 6 mounds onto ungreased cookie sheet. Bake 11 to 12 minutes or until golden brown. Fill and top with sauce.